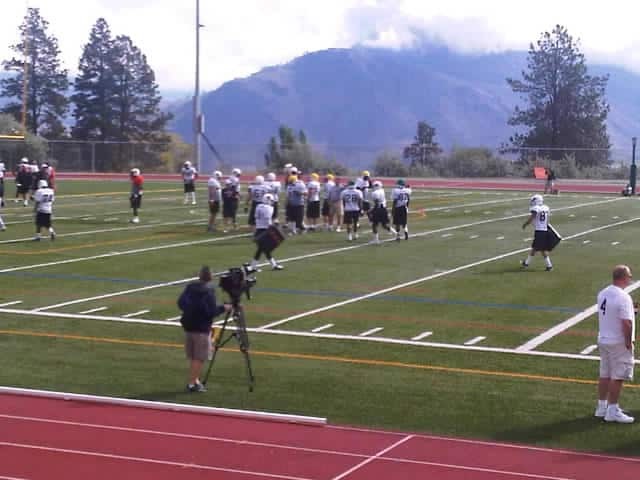 Good morning Bc Lions fans, and welcome to the morning session live blog for June 8th, day 3 of training camp. 8:50am: We spared you the warmup details today so let’s get to it. Receivers are running routes as the QB’s are cycling through and hitting targets. Defensive line is working with Stubler, offensive line with Dorazio as Washington and Miles work with the secondary. 9:11am: Offensive line is working on blocking schemes, both running and passing. Secondary is working on coverages with the backups making up the offense. 9:28am: The “physical” is back at practice as Aaron Hunt pops Toddrick Pendland, and Dante Marsh says hello to Reed. Offense is producing on short stuff, stuggling on mid to long range passes. Printers and Lulay getting reps, as Jarious Jackson may be taking a maintenance day on his shoulder. 9:47am: Lulay and Parrish are working on some passing routes being defended by the secondary. Printers and Jackson working with the running backs and the offensive line, being defended by the defensive line and linebackers. 10:02am: some kick return work coming up. Stubler takes the defensive line away for some work, Dorazio the same with the offensive line. Pendland, Davis, Passmore and Walker are the returners. 10:04am: No returns yet, just reviewing blocking assignments. 10:20am: Printer picked off by Dante Marsh in scrimmage. Defence is looking strong and fast. 10:24am: Its becoming clear that Jamal Robertson is your likely starting running back. At this point Pendland would be two in my opinion with Lee and Messam your fullbacks. 10:25am: Stubler is entertaining with his old school approach. He once again reminds the players your helmet does not touch the ground. 10:28am: Chapdelaine with a nice catch and protects the ball as Crawford tries to knock it out. Kickoff return work next. Davis, Passmore, Walker and Pendland back to receive. 10:44am: After some light assignment work on kickoffs practice is called for the session. Standouts, the defensive line, Marsh, Arceneaux, Henderson, Harper, Robertson. Pictures to follow tonight. See you at 4:00pm!